This is a comprehensive and user-friendly elementary level Hindi textbook and language learning package. This comprehensive guide to learning the Hindi language teaches you basic proficiency in everyday, conversational beginner Hindi. From learning to write the Hindi alphabet and pronounce its sounds, to using vocabulary and grammar, to communicating in dialogues, your rapidly-developing skills in Hindi will surprise you. No prior experience is necessary to learn Hindi with this book. The chapters cover many situations you'll need to travel to India, read Hindi, write Hindi, and speak Hindi. The MP3 audio CD helps build reading comprehension and ensures correct pronunciation. Reveals real life in India through the book's characters, Deepak and Kavitha. Covers elementary-level Hindi grammar including the rules of pronunciation, nasalizations, and the past tense. Teaches the written Hindi alphabet, allowing students to start reading and writing Hindi immediately. Makes the Hindi language accessible, understandable and enjoyable. Enriched by fascinating information about the Hindi-speaking cultures of the world, Elementary Hindi brings the language to life, whether you're studying on your own, or in a classroom. The expert guidance in Elementary Hindi is carefully sequenced to be the most efficient and most supportive approach for beginners. Delacy and Joshi are two seasoned teachers of Hindi, and their experience shines out from every page. Their knowledge will help you succeed in your goal of learning Hindi. 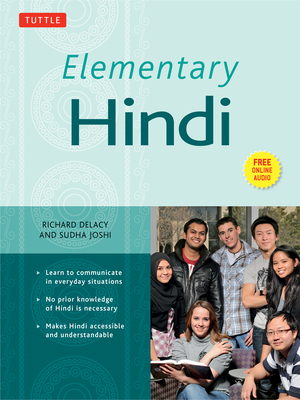 Available separately is the companion Elementary Hindi Workbook, which will help you polish the lessons learned here. The ten activities per lesson offer a range of exercises and practice opportunities that will help you achieve proficiency in everyday, conversational Hindi.